Tomatoes are the most commonly grown plant in backyard gardens, and with good reason. Nothing beats the flavor of a freshly picked tomato still warm from the sun, and homemade sauces and salsas are amazing. 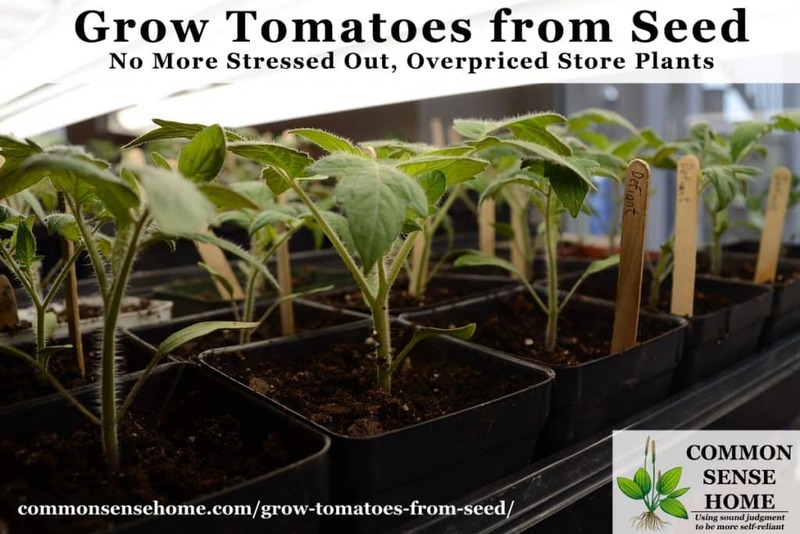 With the recent growth in gardening and interest in non-genetically modified foods, stores are starting to stock more heirloom tomato seed varieties, but they're only scratching the surface of the dozens of types of seeds that are available. 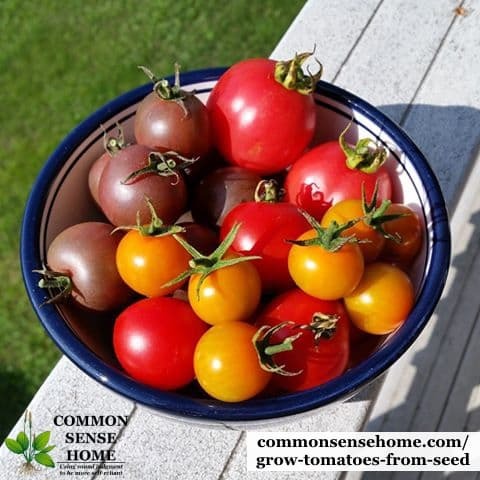 When you grow tomatoes from seed, you can pick varieties that are right for your growing conditions and experiment with many different colors, shapes, sizes and flavors for the same amount of money you'd spend on just a few store plants. My personal favorite for potting soil to date is FoxFarm Organic Potting Soil, which contains worm castings and other organic fertilizers right in the mix. You can also make your own potting soil mixes, if you are so inclined. When Should I Start My Tomato Plants from Seed? Check out the post When Should I Start My Seeds? Printable seed starting calendar to get a schedule for seed starting, hardening and planting out to the garden. I save the black plastic containers that you get plants in from the greenhouse, and have friends and neighbors save them, too. They fit neatly in seedling trays (and under my grow lights on my seed starting shelves). 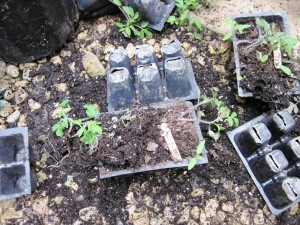 They also have drainage already built in, which is critical for healthy plants. They last for many years, and stack easily for storage at the end of the season. Basically, if it will hold dirt and allow drainage, you can probably use it to start seeds. I like to mark my seeds using popsicle sticks broken in half. I write the name of the variety on both sides of the stick with a ball point pen (in case it gets it gets wet, which it will, generally one side remains readable). 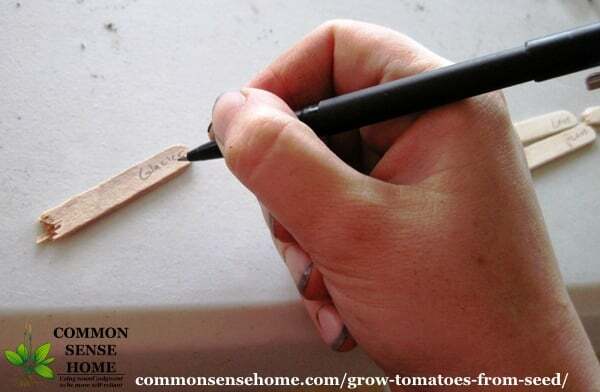 The popsicle sticks are cheap and reasonably durable, and also be tossed in the compost when they are no longer needed. 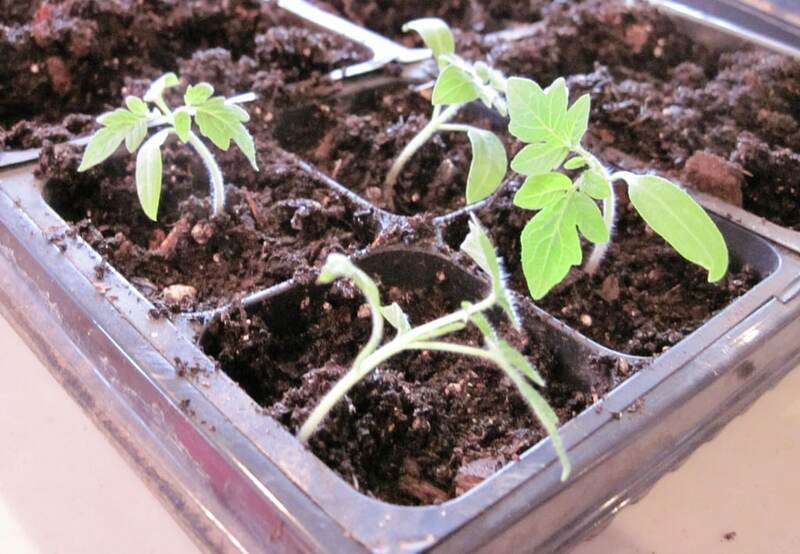 How Deep Should I Plant My Tomato Seeds? As a rule of thumb, you want to plant seeds roughly three times as deep as the seed is wide, so tiny seeds stay on or near the surface, and larger seeds go a little deeper. 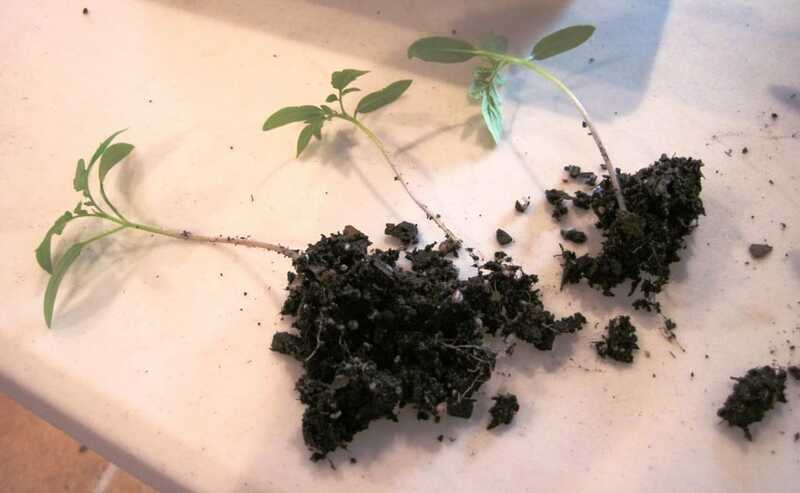 You may want to do a quick soil test on your potting mix before you start, as many on the market are lacking in key nutrients and/or overloaded with other nutrients. 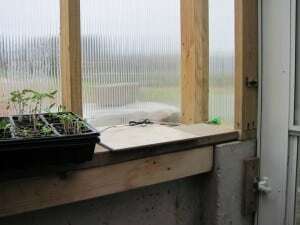 Cover the seeds with a clear plastic cover, and put them in a well lit location. I like to give them a little jump start with a seedling heating mat underneath, since they like a little extra warmth to get going. I put the heating pad and the lights on a timer, leaving them on for about 16 hours a day and off for the remaining time. If you'd like some more photos of my planting bench and seed starting setup, take a peek at this post on seed starting. Can I Use Old Old Tomato Seeds (Left Over from Previous Years)? Because I plant so many varieties, I end up with leftover seed from year to year. 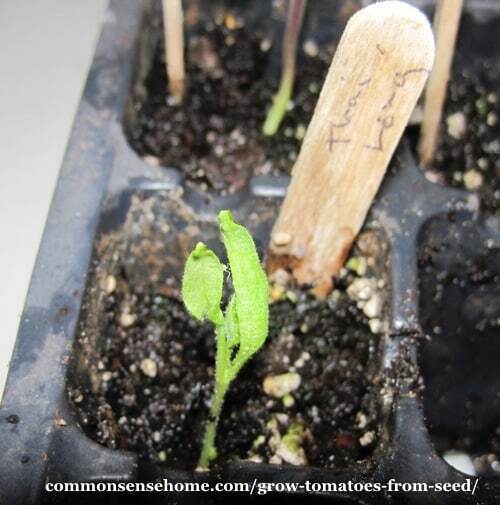 Tomato seeds generally store quite well (I have had some last over 10 years), but the germination rates decrease over time. I made up a simple spreadsheet in Excel where I track date planted, variety, seed source, number of seeds planted, date of first seedling appearance and final number of seedlings. (You can see the sheet and print your own copy in the post, “Free Gardening Journal Templates and Other Garden Record Keeping Tips“. This allows me to compensate for the reduction in germination rates over time. 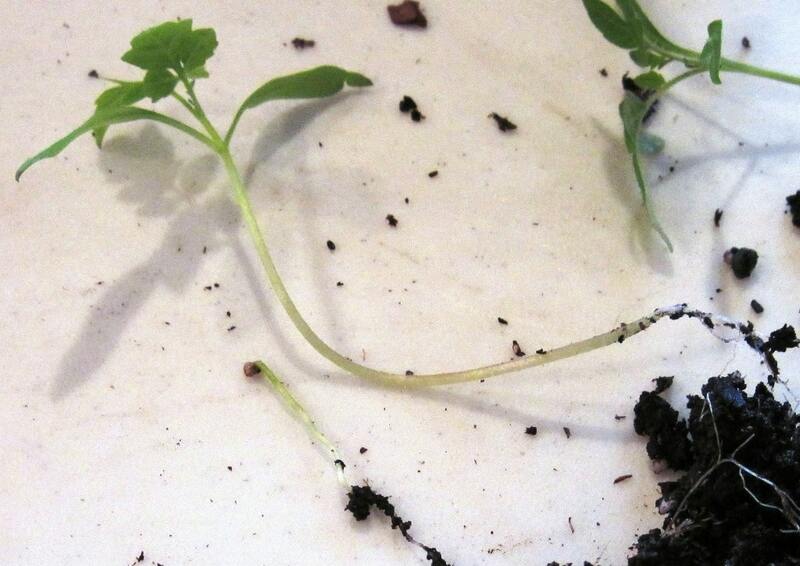 Once you get seedlings popping up, uncover them within the first 24 hours. Keeping them covered can lead to damping off. Damping off results from fungal infection. 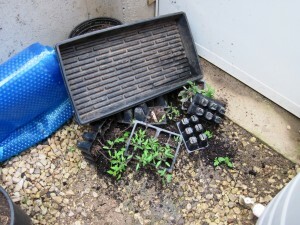 It generally comes from keeping your seedlings too wet. One day they'll look fine – then WHAM! The seedlings are laying there dead. Generally the stem shrinks up near ground level, and the soil is very wet. Sometimes here will be mold or fuzz growing on the surface of the soil. (Yes, I have made this mistake – it's not pretty.) A sprinkle of cinnamon or a spritz of chamomile tea may help save the remaining seedlings, but once a plant has keeled over, it's a goner. To help prevent damping off, some folks sprinkle sand over the dirt when they plant seeds – just enough to cover the top of the soil – but if you maintain proper moisture levels and good circulation, damping off shouldn't be a problem. If the color of your seedlings is off – check moisture levels. You want damp soil, not too wet or too dry. If the moisture level seems fine, try a soil test. As I mentioned above, some soil mixes are just not right. If your seedlings are really tall, skinny and floppy (also known as “being leggy”) – chances are your lighting is inadequate. Try a different location or more artificial lighting. 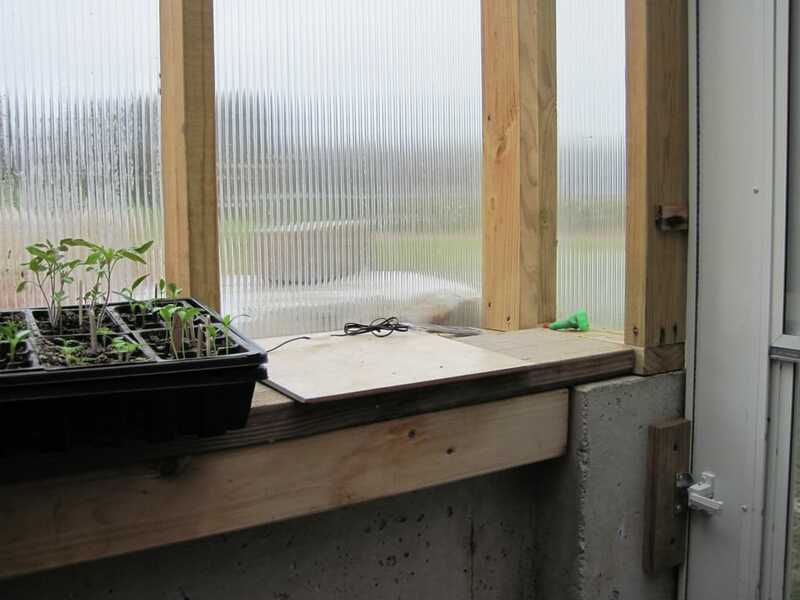 Putting a fan on a timer and having it blow on the seedlings off and on through the day will also help toughen up stems (and prevent damping off and other diseases – ever wonder why they have those fans running all the time in commercial greenhouses?). If you've got leaf tips that are pinched together by a seed that didn't fall off, like this (this plant is an eggplant, not a tomato, but you get the idea). It is okay to gently remove the stuck seed. Try not to tear the leaf. This will go a little easier if the seed is moist. As the tomatoes get larger, they can be moved into a greenhouse or cold frame – just make sure to keep them from freezing (preferably between 50-80F). Yes, the tops and bottoms of these tomatoes have been parted, never to be whole again. Thankfully, most of the varieties killed were ones that I had in excess. What's the Difference Between Determinate and Indeterminate Tomatoes? 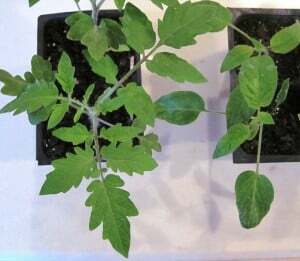 If you end up trying to determine varieties from a scrambled mess of plant material and dirt, here is a comparison of the main types of tomato foliage. In terms of leaf shape, you have regular leaf (RL) plants and potato leaf (PL) plants. Growth-wise, you have determinate and indeterminate. From left to right, we have RL indeterminate, PL indeterminate, and RL determinate. 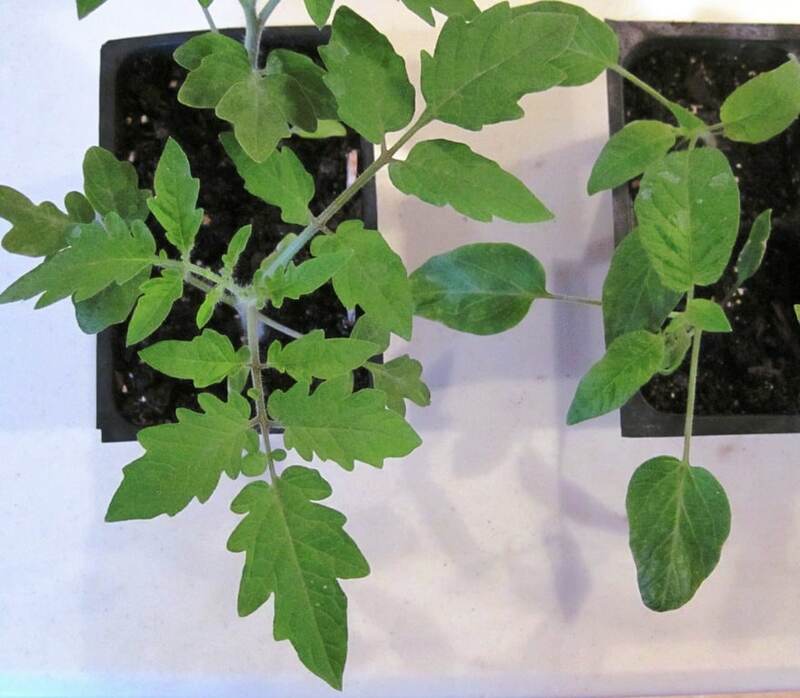 You can see the RL determinate plant on the left has more, smaller, branched leaves, while the PL determinate plant has fewer, larger leaves. 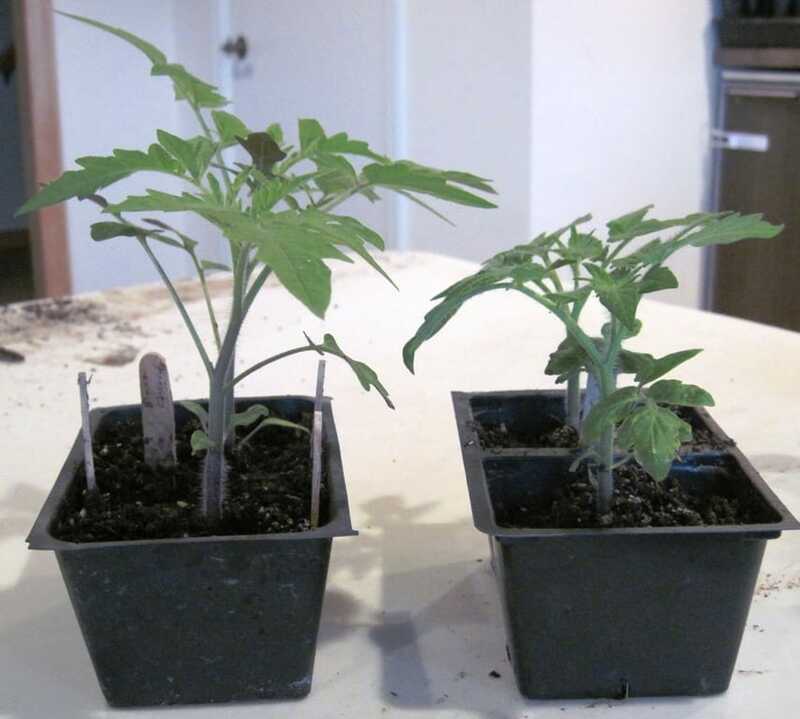 Comparing indeterminate to determinate, the indeterminate on the left is taller and leggier, while the determinate plant is smaller and stockier. Indeterminate plants will continue to grow larger and set fruit until frost – mine commonly reach six feet or more in height. As the end of the season approaches, you may wish to pinch off new growth to focus their energy on maturing existing fruit. 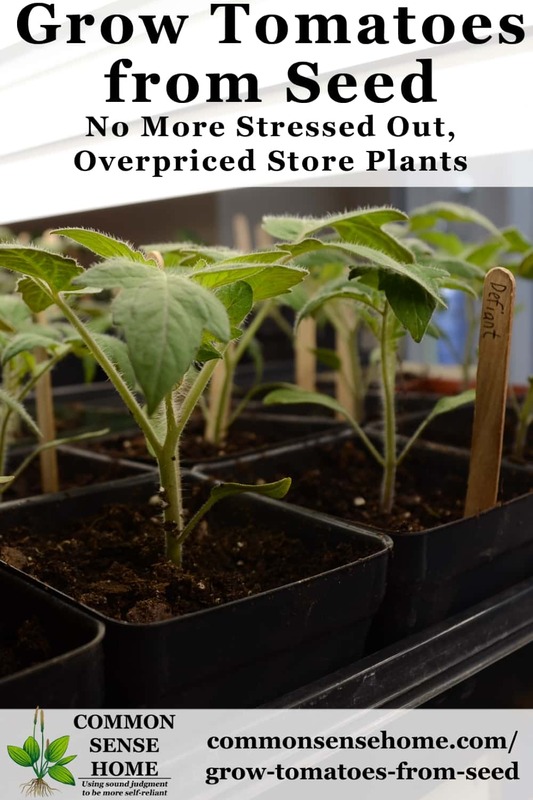 Determinate plants will grow to a more modest size (they often don't require staking, and thus are generally preferred by commercial growers). They set all their fruit at roughly the same time and are ready for harvest during a narrow window of time. Most heirloom varieties are indeterminate, while most modern hybrids are determinate. I start my seeds in the cell packs with openings that are roughly 1 inch square. As they grow, I transplant them into larger containers. First, I'll move them to two inch containers, then up to three or four inch, depending on how fast they're growing and how long until I can get them in the garden. 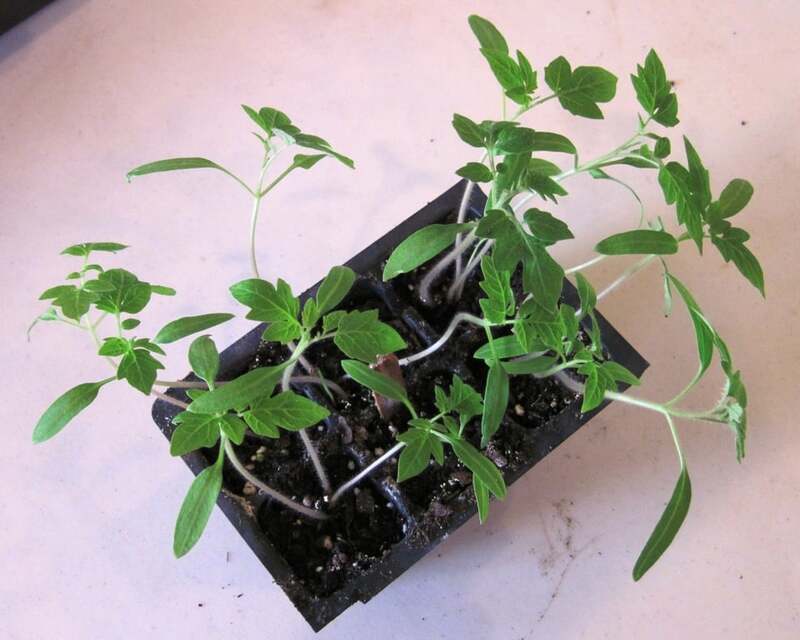 Here's a cellpack of tomatoes that's more than ready for transplant. You can see they're a bit overcrowded and leggy. You can generally transplant any time after they get their first “true” leaves (the leaves that look like tomato leaves, not the first little oblong leaves that appear). I confess, my plants can get a little overgrown before I get to them. I have seen some gardening gurus recommend cutting off the excess seedlings in each cell at ground level with a scissors and keeping only the strongest, but I just can't bring myself to kill healthy little plants. Gently pry a group of seedlings out of their cell, pushing up from below as you pull from the base of the plant above. Ease the roots apart, trying to keep as much soil as possible on the roots. If you encounter a severely stunted plant (like in the bottom left corner of the photo below), don't bother trying to save it – it won't grow. Trust me on this. Transplant seedlings as deep as possible in their new container. This will help support the stems. Yes, it's okay if bottom leaves are covered. In a few weeks, I graduate the plants to the larger pots. When it's getting close to the time to plant them outside, I start hardening them off. “Hardening off” plants is the process of gently introducing them to the outside elements to toughen them up enough to survive in the garden. You want to take it slow, or you'll end up killing all your little seedlings (again, trust me on this). 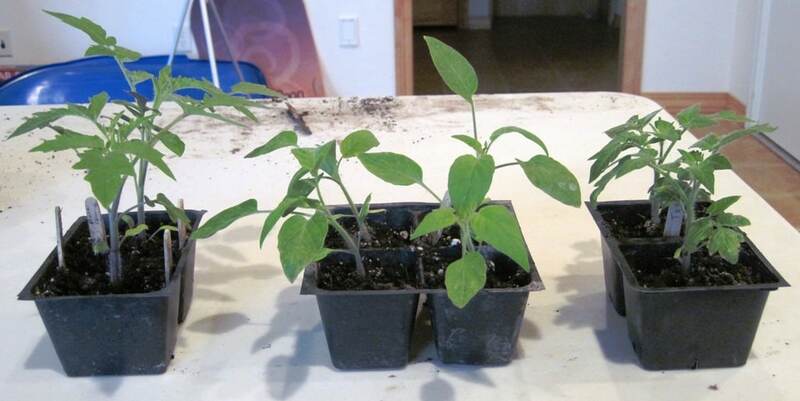 I prefer to harden them off over 3-4 days, starting them out with no more than an hour or two of direct sun the first day and increasing exposure each day. Make sure they are protected from the wind and adequately watered when you set them out. A little extra TLC at this point goes a long way. When you plant them in the garden, I prefer deeper holes over shallow trenches (in my climate and location). Planting deep (just leaving a few inches of leaves exposed above ground) will yield a more robust, more drought tolerant plant. The plant will send out new roots from the buried stem. I add a small handful of crushed eggshells to the planting hole to help prevent blossom end rot, which is caused by inadequate calcium levels and is generally made worse by fluctuating moisture levels in the soil. 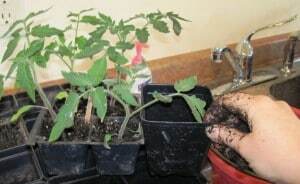 Tomatoes like rich soil, so I also add some well rotted manure or worm castings, but you don't want to add too much (a shovel full per planting hole is enough). Too much nitrogen will give you too many leaves and not enough tomatoes. I also mulch, trellis and often add a soaker hose under the mulch for watering. To get the full scoop on planting and TLC for your best tomato crop ever, visit How to Grow Tomatoes Organically – 7 Tips for Success. Originally published in 2011, updated January 2016. Awesome article Laurie. I noticed the Popsicle sticks to mark the plants and I wanted to share that I use old mini-blind slats. They are easy to cut and you can write on them really easy with a Sharpie. Just another way to reuse something that would otherwise end up in the trash! Great idea with the mini blinds!! I had a dollar store cutting board, the super thin white kind that come 2 in a pack, left over from a project, and I cut it into small strips to use as plant labels. It too is very Sharpie friendly! Very helpful! I can't wait to try some from seed next year. I am using worm castings for the first time this year. Thanks! I've used the mini blinds before when we got some old ones from a friend, but don't have any handy at the moment. They work pretty well. Cassie – I'd be interested in hearing how your worm casting enhanced plantings turn out. I've had very good results with mine. I planted a test plot this year with side by side plantings with castings and without, and will be monitoring the progress. I, too, have had a year of trails. I had two crop failures of broccoli and cabbage,(dampening off ) and almost a total crop failure of 200 tomato plants! I FINALLY got things figured out and growing in the right direction. Then planted the cucunbers and left them in the green house over night. Where the seeds were ALL dug up and the hulls pulled apart and sinsides eaten! MICE! Replant leaving them in the house it they were up. Fianlly planted the about a week before Memorial weekend. Memorial weekend blew in with 50-70 mile an hour winds! Half of the 3 dozen plants killed! At this moment, knock on wood cross fingures pray and every thing else, things are going and groing well! Instead of popcicle sticks I write on one side of a wooden clothes pin with a sharpie the next year new color and a straight line through old label. Always have tons of clothes pins as I hang our wash year round. One of my gardening ‘Bibles” is SECRETS OF COMPANION PLANTING…’ By Louise Riotte and you can find a copy at Bakers Creek.. Anyways from them I learned to place two or thrre white icicle radish seeds in all my winter, summer squash, MELONS, and cucumbers hills and let then grow and even go to seed. I have a LOT less bug problem when I remember to plant the radish with them! Nice article, are you a member of our TomatoMania Group? Great info files, free seed bank, and help for gardeners from novice to seasoned. Since you are using our registered name of Tomato Mania I thought you must be a long time member, but I don’t recognize your name. Sorry, no, I’ve never heard of the group. Tomato mania was just what came to mind as my home got overgrown by tomato plants. With such a scarcity of bees, how do the tomato plants get pollinated? They will self-pollinate and wind pollinate to some extent, but if you notice you have blossoms and no tomatoes, you may want to start hand pollinating. hi one of the things i learned years ago from my mom.how to stop damping off. yes i said stop damping off, after planting sprinkle clean sand over the top of the dirt . 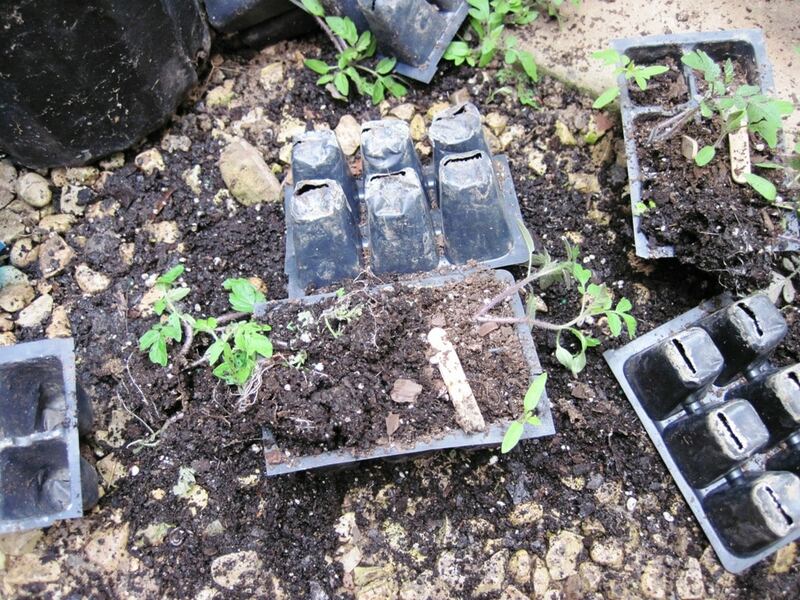 just cover the dirt so the fungus cant grow.and dont heat or cover with plastic. this increases the bactiria growth.its the best way i have found to stop the loss of babys. hope this helps you. i come from a long line of farmers in illnois.i have had my own garden at the age of 3. Not sure about the sawdust, but everything else sounds very similar to the way I plant tomatoes myself. Entertaining and informative post! Thanks a bunch. I can relate to the mess of downed bedding plants! Lucky for the cat he was not involved this time! For some reason the entire free standing shelf shifted to one side and went down. Luckily most were still in the pots and little damage but my determination to have everything labeled and organized in the garden this year went down with the mess! It will be interesting to see what kind of cross pollination developers with the squash in particular. 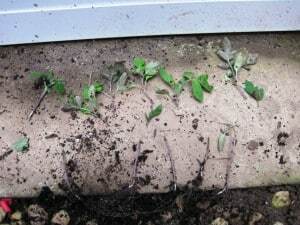 An strange thing happened with the tomato bedding plants this spring and wonder if you have had any experience like this. I was so excited to have 100% germination but when the plants got to about 1 1/2″ tall growth stopped and they did not grow anymore! I ended up purchasing replacements of what ever variety I could find once it was obvious growth was reluctant to come. We have started our own tomato plants for years and this is the first time anything like this has happened! Maybe the thud as they hit the floor scared the life out of them! Ha! Ha! 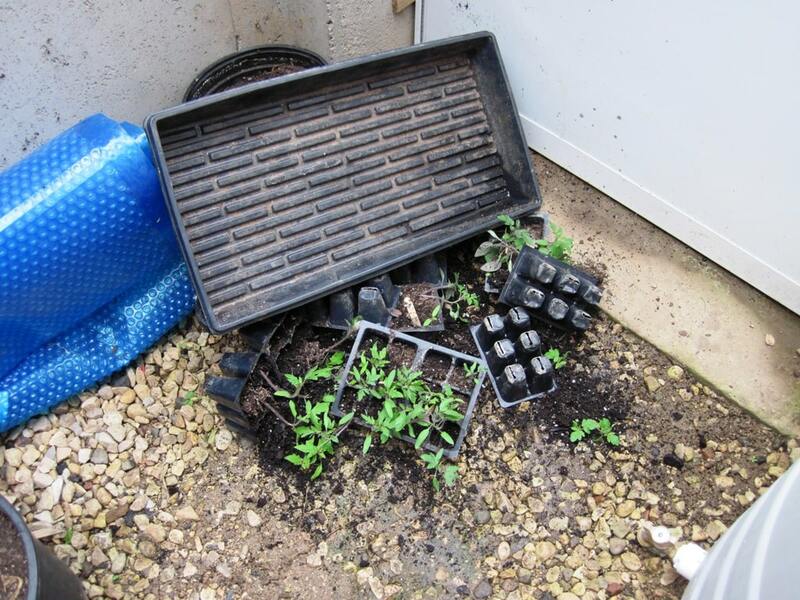 There are studies that indicate plants do “feel” trauma, but I suspect it might be your potting soil. Some of the brands I’ve used have given me exactly that effect, even when I use water with added fertilizers like fish emulsion. I stopped using Espoma and have switched to Fox Farm organic and have gotten much better results. 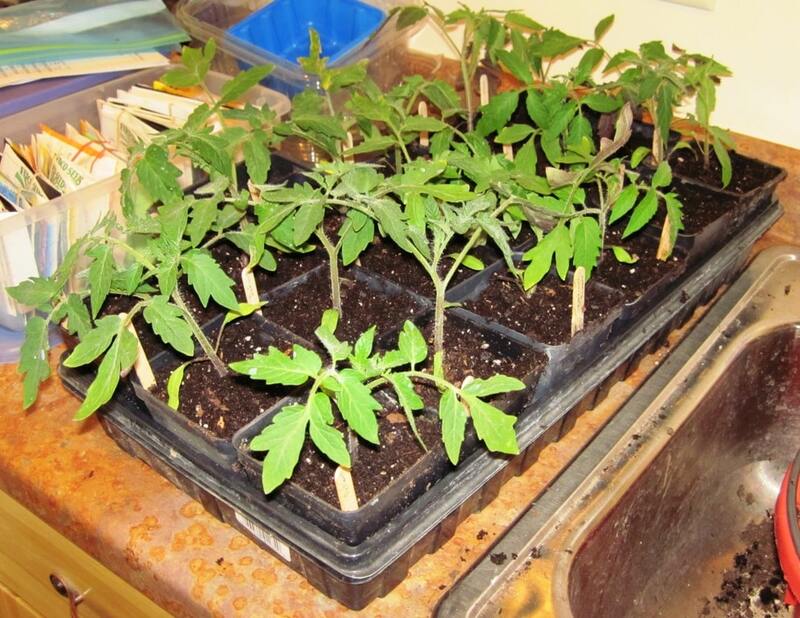 When we were living in Texas, thankfully it was warm enough to sow my tomato seeds straight to the garden. Now that we’re in Colorado, I have this challenge to try. I’ve never had any luck with starting seeds indoors but hopefully with the help of your post, this year will be different. Thank you and wish me luck! Newbie question here, when you transplant to bigger pots, do you use the same mix as you did in the small cell packs, or do you eventually change the potting mix? I’ve struggled post transplant to get the plants to continue to grow. They appear to be stunted and can’t figure out why. Starting a new batch now, albeit later than I’d like, just to get a win under my belt . Yes, I use the same potting mix when transplanting to bigger pots. 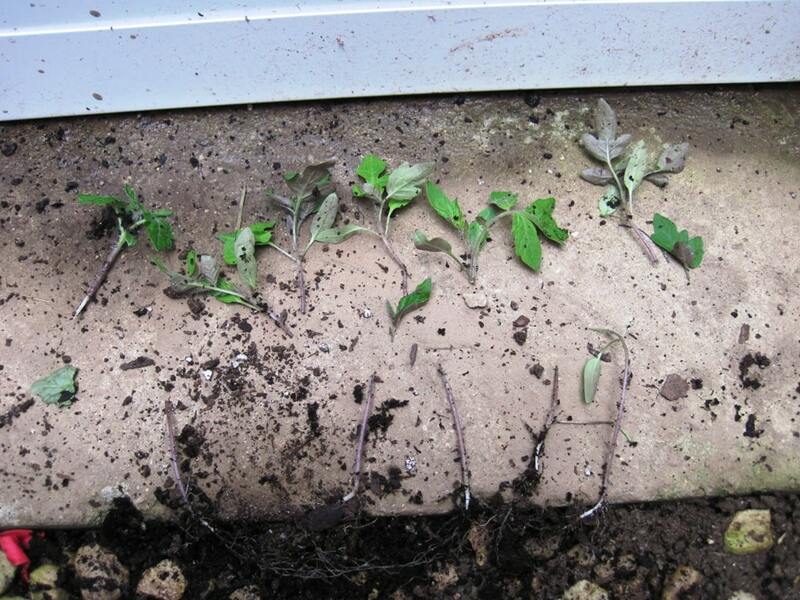 If plants are failing to thrive, do a soil test on your potting mix. Some I’ve tried in the past have been completely devoid of nutrients. Also, watering with diluted fish emulsion or kelp based fertilizer every couple of weeks will help give the seedlings a jump start. Just joined this site. It is very informative. 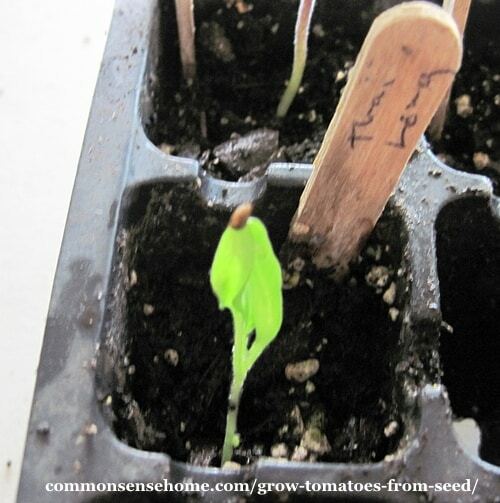 I have been indoor planting tomatoe seeds for past five years with poor success. I shall try many of the suggestions. 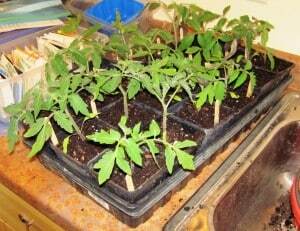 I noted comments of planting tomatoe seeds in small containers then transplant to larger containers as needed. I usually plant in larger container from the beginning. Is there an advantage in planting seeds in smaller container or is this just a logistical practice. In my case it’s a bit of both. Because I plant a lot of seedlings, keeping the little ones in small pots at first means that more fit under the grow lights. With tomatoes, I start them inside well before they go out in the garden, so over time they tend to get a little leggy. As I pot up, I can bury part of the stem, keeping the plant a little sturdier. With abundant light and a shorter amount of time until transplant, there’s no problem with going directly to larger pots.